I love making dinner. But, some nights, Chris is away at a work event and I'm not in the mood to create something fancy just for myself. Give me a bowl of cereal, a couple spoonfuls of peanut butter, or a tomato sandwich, and I'm good. Still, deep down, I'll leave the kitchen unsatisfied and wanting something more. So now, when I'm cooking for myself and a handful of crackers just won't do, I use this handy little trick and make myself some yummy Mac 'N' Cheese. . . in the microwave. No messing with boiling water or turning on the stove. . . and 10 minutes later, voilà! Comfort food, made-to-order. 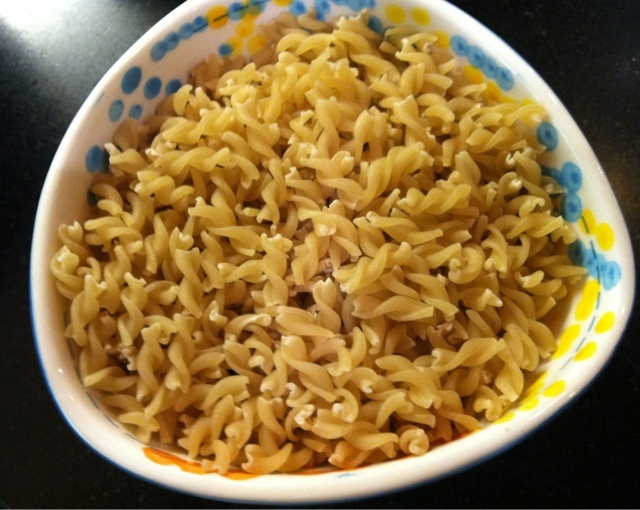 Pour the hot water into a 2-quart microwaveable dish, then add the dried pasta. Place the uncovered dish in the microwave and cook for no more than 10 minutes on high, stopping every 2 minutes to stir and check for doneness. At the 6 minute mark, stir in the frozen peas, and continue cooking. Grate some of the cheese over your serving and devour! Note: Sometimes when I'm desperate, I just grab a boxed macaroni and cheese mix and toss out the cheese packet, then move forward with the recipe above. Also, for another tasty version, you can omit the peas, stir in grated cheddar cheese instead of the Romano, and use diced tomato instead of bacon. Or even easier, just stir together the cooked pasta, butter, some chopped fresh herbs and finish with a sprinkle or two of grated Romano. Heaven! Cale will think he died and went to heaven!!! !